Editor’s note: The following review is part of Macworld’s GemFest 2013. Every day (except Sunday) from mid-July until late September, the Macworld staff will use the Mac Gems blog to briefly cover a standout free or low-cost program. You can view a list of this year’s apps, updated daily, on our handy GemFest page, and you can visit the Mac Gems homepage for past Mac Gems reviews. Nasturtium Player 1.0.6 (Mac App Store link) is a YouTube and music player that lets you create hours of playlists without the hassle of switching apps or windows. 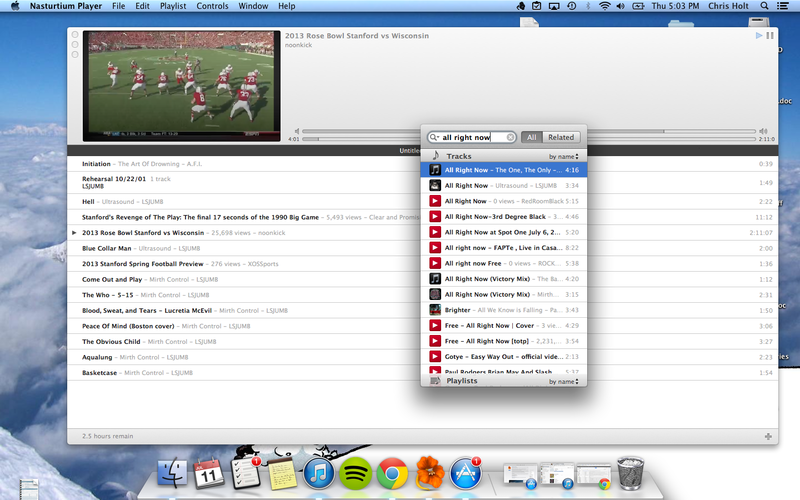 You can drag and drop music and YouTube videos into the handy Nasturtium interface or use the mini player. The potential is fantastic, but the reality is unfortunately a bit finicky—copying and pasting the URL from YouTube worked much better for me than actually dragging and dropping the videos. Still, as far as aggregate media players go, Nasturtium has an intuitive interface and robust search feature that finally lets you put Youtube music videos next to your iTunes favorites—right where they belong. Compile your iTune and YouTube videos into a playlist you can enjoy through Nasturtium Player.